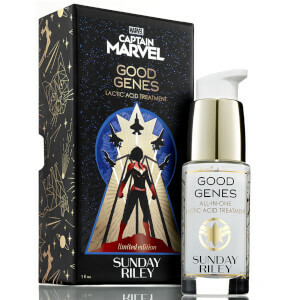 Join the fight for great skin with Sunday Riley’s limited-edition Good Genes all-in-one Lactic Acid Treatment designed in collaboration with MARVEL. Formulated with high potency, purified grade Lactic Acid that immediately exfoliates dull, pore-clogging dead skin cells, revealing smoother, fresher, younger-looking skin. Fine lines appear visually plumped while the skin looks more radiant. With continued use, the appearance of stubborn hyperpigmentation and the visible signs of aging are reduced for a healthier-looking complexion. Apply 1-2 pumps to clean, dry skin as a leave-on treatment. Use day or night. -Can be applied on top of Luna Sleeping Night oil, and before your moisturizer. 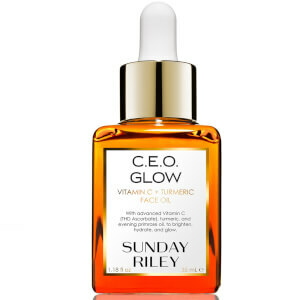 -For sensitive skin, use as a mask. Apply 1-3 pumps to clean, dry skin and leave on for 15 minutes. Rinse well and pat dry. 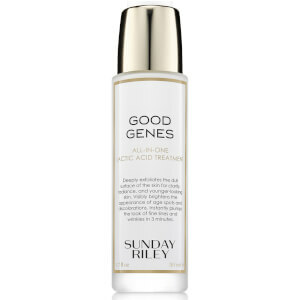 -Can be combined with Ceramic Slip (Mix equal parts of Good Genes and Ceramic Slip Cleanser) for a "Flash Facial" mask. Leave on for up to 10 minutes, and rinse clean for an instantly refreshed complexion. Botanical Complex [Water/ Eau/ Aqua, Opuntia Tuna Fruit (Prickly Pear) Extract, Agave Tequilana Leaf (Blue Agave) Extract, Cypripedium Pubescens (Lady's Slipper Orchid) Extract, Opuntia Vulgaris (Cactus) Extract, Aloe Barbadensis Leaf Extract and Saccharomyses Cerevisiae (Yeast) Extract] Lactic Acid, Caprylic/Capric Triglyceride, Butylene Glycol, Squalane, Cyclomethicone, Dimethicone, PPG-12/ SMDI Copolymer, Stearic Acid, Cetearyl Alcohol Ceteareth 20, Glyceryl Stearate, PEG-100 Stearate, Arnica Montana (Flower) Extract, PEG-75 Meadowfoam Oil, Glycyrrhiza Glabra (Licorice) Root Extract, Cymbopogon Schoenanthus (Lemongrass) Oil, Triethanolamine, Xantham Gum, Phenoxyethanol, Steareth-20, DMDM Hydantoin., Botanical Complex [Water/ Eau/ Aqua, Opuntia Tuna Fruit (Prickly Pear) Extract, Agave Tequilana Leaf (Blue Agave) Extract, Cypripedium Pubescens (Lady's Slipper Orchid) Extract, Opuntia Vulgaris (Cactus) Extract, Aloe Barbadensis Leaf Extract and Saccharomyses Cerevisiae (Yeast) Extract] Lactic Acid, Caprylic/Capric Triglyceride, Butylene Glycol, Squalane, Cyclomethicone, Dimethicone, PPG-12/ SMDI Copolymer, Stearic Acid, Cetearyl Alcohol, Ceteareth 20, Glyceryl Stearate, PEG-100 Stearate, Arnica Montana (Flower) Extract, PEG-75 Meadowfoam Oil, Glycyrrhiza Glabra (Licorice) Root Extract, Cymbopogon Schoenanthus (Lemongrass) Oil, Triethanolamine, Xantham Gum, Phenoxyethanol, Steareth-20, DMDM Hydantoin., Botanical Complex [Water/ Eau/ Aqua, Opuntia Tuna Fruit (Prickly Pear) Extract, Agave Tequilana Leaf (Blue Agave) Extract, Cypripedium Pubescens (Lady's Slipper Orchid) Extract, Opuntia Vulgaris (Cactus) Extract, Aloe Barbadensis Leaf Extract and Saccharomyses Cerevisiae (Yeast) Extract] Lactic Acid, Caprylic/Capric Triglyceride, Butylene Glycol, Squalane, Cyclomethicone, Dimethicone, PPG-12/ SMDI Copolymer, Stearic Acid, Cetearyl Alcohol, Ceteareth 20, Glyceryl Stearate, PEG-100 Stearate, Arnica Montana (Flower) Extract, PEG-75 Meadowfoam Oil, Glycyrrhiza Glabra (Licorice) Root Extract, Cymbopogon Schoenanthus (Lemongrass) Oil, Triethanolamine, Xantham Gum, Phenoxyethanol, Steareth-20, DMDM Hydantoin., Botanical Complex [Water/ Eau/ Aqua, Opuntia Tuna Fruit (Prickly Pear) Extract, Agave Tequilana Leaf (Blue Agave) Extract, Cypripedium Pubescens (Lady's Slipper Orchid) Extract, Opuntia Vulgaris (Cactus) Extract, Aloe Barbadensis Leaf Extract and Saccharomyses Cerevisiae (Yeast) Extract] Lactic, Acid, Caprylic/Capric Triglyceride, Butylene Glycol, Squalane, Cyclomethicone, Dimethicone, PPG-12/, SMDI Copolymer, Stearic Acid, Cetearyl Alcohol, Ceteareth 20, Glyceryl Stearate, PEG-100 Stearate, Arnica Montana (Flower) Extract, PEG-75 Meadowfoam Oil, Glycyrrhiza Glabra (Licorice) Root Extract, Cymbopogon Schoenanthus (Lemongrass) Oil, Triethanolamine, Xantham Gum, Phenoxyethanol, Steareth-20, DMDM Hydantoin.